If you’ve ever seen My Big Fat Greek Wedding, you’ve seen the famous scene where the lead character wakes up on her wedding day and has a zit. Panic ensues but the father comes to the rescue and promptly spritzes Windex on the little red spot. In the next scene, she’s on her way to the chapel, and low-and-behold, the pimple has disappeared. Unfortunately, we can’t just spritz a common household cleaner on our faces and hope for the best. Instead, we have to be more prepared than any girl scout has ever been prepared before. 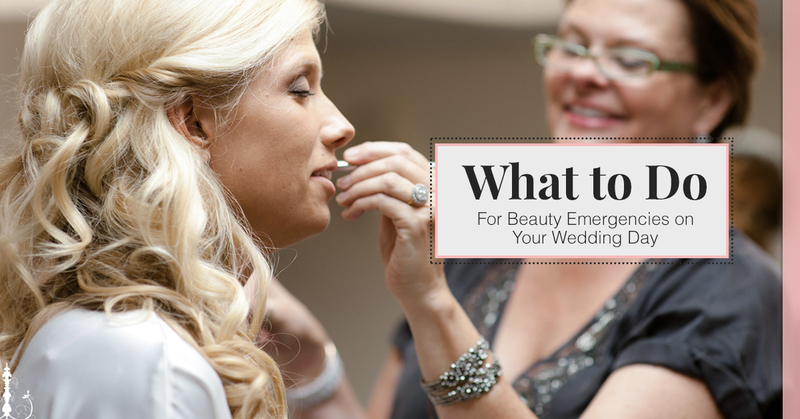 So what do you do when an actual beauty disaster befalls you on your wedding day? You turn to the wedding makeup pros at Kiss’ N Makeup and follow our advice carefully. Turn to the spoon. It’s a weird trick, but it’s been in circulation for hundreds of years, or since women got ahold of mirrors. If you wake up with puffy eyes on your wedding day put two spoons in the freezer for 15 minutes, and then hold the bottom of the rounded part of the spoon to your eyelids. The coolness of the metal will help the swelling leave the eyelids and the blood vessels around your eyes. If this doesn’t work, try splashing your face with some cold water, you’d be surprised how much that can do. This is stressful, granted, but this is why there are nail files. File down your fractured nail without removing the polish. and smooth the rough edges with a sanding block. If nothing else comes to mind, hide the broken nail behind the bouquet for the pictures. It might not be the best solution, but if this is the only monkey wretch that gets thrown your way, consider it a blessing. You might not have it yet, but it is worrisome that it might come for you when you least expect it. Rather than risk it, drink with a straw and blot the lipstick after applying because smears of any kind aren’t going to make you picture ready. The less fuss, the better. 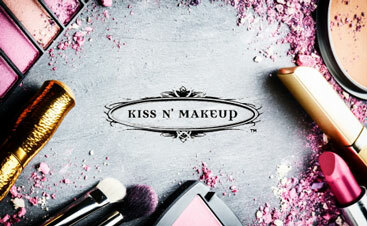 If you were clever about making sure you and your wedding party are camera ready, you probably hired Kiss N’ Makeup to take care of your wedding makeup. Our services include a design, a test run, and day-of application. That means Kiss N’ Makeup will be there to help with whatever could possibly go wrong with your look. We put thought and effort into this day going off without a hitch, and we’re not about to let a pair of lashes or a pimple get in the way of making this day as perfect as you’ve always envisioned it. We’re here to make you look perfect and field emergencies that your mom can’t. Ready to make sure that your to make sure that your wedding goes off without a hitch? Schedule your service with us, and we’ll create the perfect look for your dream day. We’ll collaborate with your vision and find a great way to incorporate your naturally beautiful features with the design you’ve chosen. We’re here to make sure that you’re stunned and stunning on your special day. Let’s make it happen now. Contact us to schedule your initial appointment today.